Water from the tap in St Joseph, La. The governor of Louisiana declared a public health emergency Friday after the water supply in a town in that state, St. Joseph, was found to be contaminated with lead and copper Thursday. Gov. John Bel Edwards said that state testing showed elevated levels of lead at a private residence as well as the town hall building, and elevated copper levels at two private homes, prompting him to declare the public health emergency (pdf). St. Joseph is a small town with a predominantly African-American population of about 1,100 people. It is the town Ava DuVernay's Queen Sugar is based in. The Governor’s Office of Homeland Security and Emergency Preparedness (GOHSEP) has released one month’s supply of bottled water to the Town of St. Joseph. Each individual will receive 3 liters of water per day. The bottled water supply will serve as a temporary remedy. A more permanent source is made available to the Town of St. Joseph while construction is underway. Residents can receive bottled water tonight after 6:30 p.m. at the Town Hall on Main Street. While initial test results show that the instances of elevated lead and copper levels are exclusive to these locations, Gov. Edwards has ordered testing of every household in the town within four weeks. 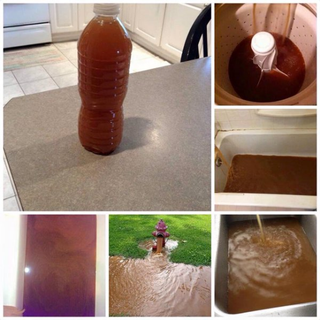 NPR reported in February that residents there have had concerns about the water supply for nearly a decade; tweets from residents showed brown or yellow water coming from the taps. Louisiana State Health Officer Jimmy Guidry told NPR in February that most of St. Joseph’s issues center on pipes that are 90 years old and constantly being repaired. "Like most small water systems, when you don't have many customers, it's very expensive and it's not affordable," Guildry said. "But they have to do so because right now there's risk of worse things than color. "It could take years,” Guidry continued. “It's the kind of thing which, if you don't maintain it along the way, you're going to have to take care of it when it gets in trouble, and now it's in serious trouble. And it's going to be very costly to take care of those issues." Meanwhile, Boyte said in February that the attention being paid to the St. Joseph water system was at least in part due to the situation in Flint, Mich.: "What's happening here in St. Joseph got the attention it's gotten because Flint has made water a public issue."